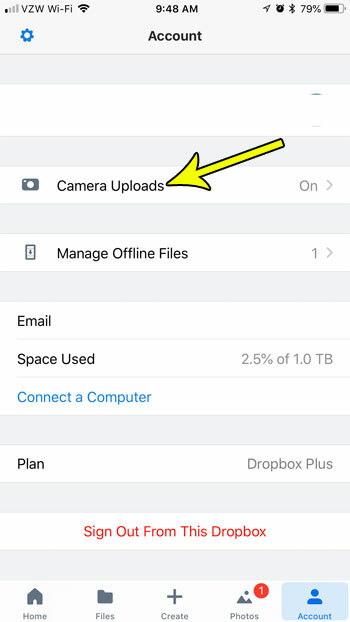 The ability of the Dropbox app to upload pictures from your iPhone’s Camera Roll to your Dropbox account is very helpful, and it’s something that I use a lot when I include iPhone screenshots in articles on this site. Once the pictures are uploaded, I simply need to open my synced Dropbox folder on my computer and edit the pictures as necessary. But typically the pictures won’t upload until I open the Dropbox app, which can occasionally take a while if I have a lot of pictures to upload. One way to make this process a little simpler is by enabling a setting called Background Uploading. 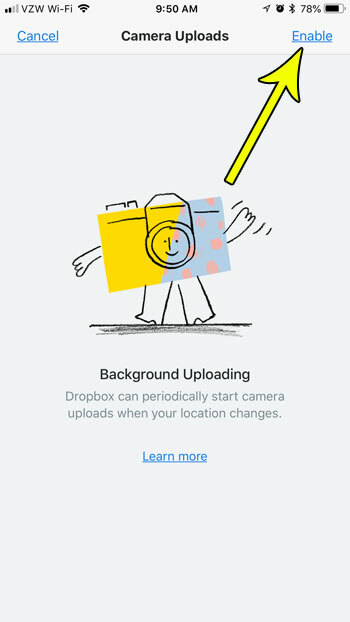 This will let Dropbox upload your pictures in the background when your location changes, which can be a useful way to ensure that you don’t wind up with a huge queue of images to upload if you’re in a hurry. The steps in this article were performed on an iPhone 7 Plus in iOS 11.3.2. 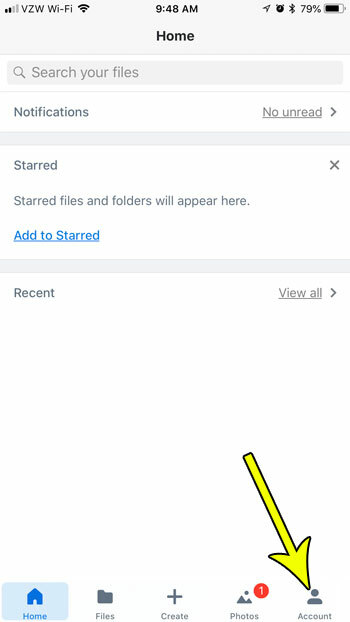 By enabling this feature you will be allowing the Dropbox app to upload files from your phone to your Dropbox account in the background while you are using other apps, or while your phone is inactive. Additionally, background uploading will occur when your location changes. 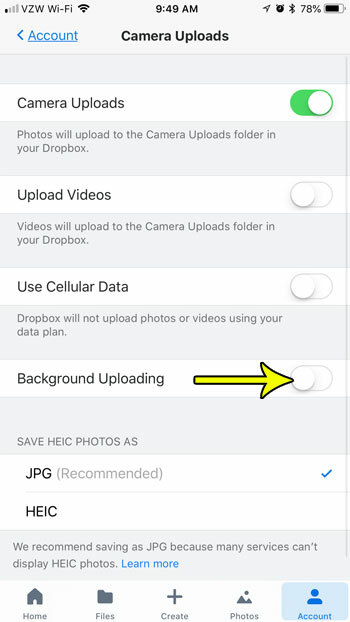 Because of this you will need to give Dropbox access to your location for the background uploading to function properly. 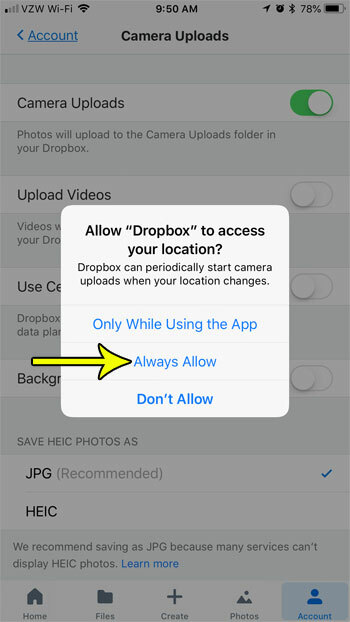 If you are curious why you need to give permissions for location, check out this article on Dropbox’s site. Step 1: Open the Dropbox app. Step 2: Select the Account tab at the bottom-right corner of the screen. Step 3: Choose the Camera Uploads option. Step 4: Tap the button to the right of Background Uploading. Step 5: Touch the Enable button at the top-right corner of the screen. Step 6: Choose the Always Allow option so that the background uploading feature can work as intended. Do you have a passcode set for your Dropbox app, but it’s becoming a bit of a nuisance? 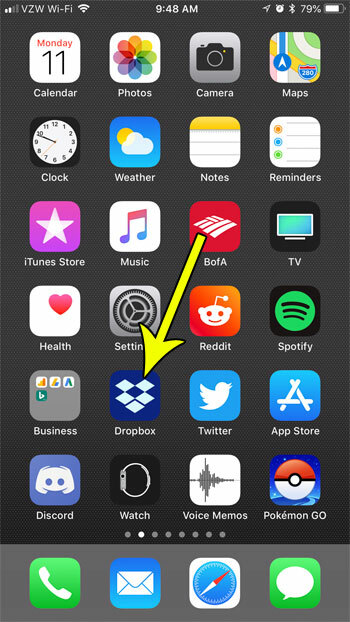 Find out how to disable the Dropbox passcode on your iPhone if you would like to start using the app without that additional security precaution.